The Sears Magnolia, offered from 1918-1922, seems to be a source of a much misinformation and confusion. Yesterday, someone sent me a link to another purported “Magnolia” in Watseka, IL (719 South Fourth Street). 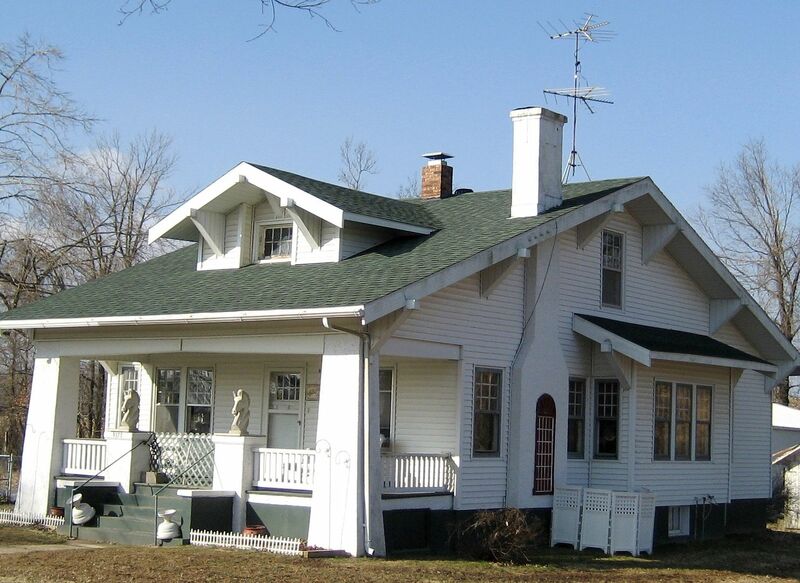 And then a member in our “Sears Homes” Facebook group showcased a quote from author Daniel Reiff (Houses from Books) stating that even though the house in Watseka is not a Sears Magnolia, it may have been an inspiration for the Sears architects. Built models might have also been an influence [for the Sears Magnolia]. 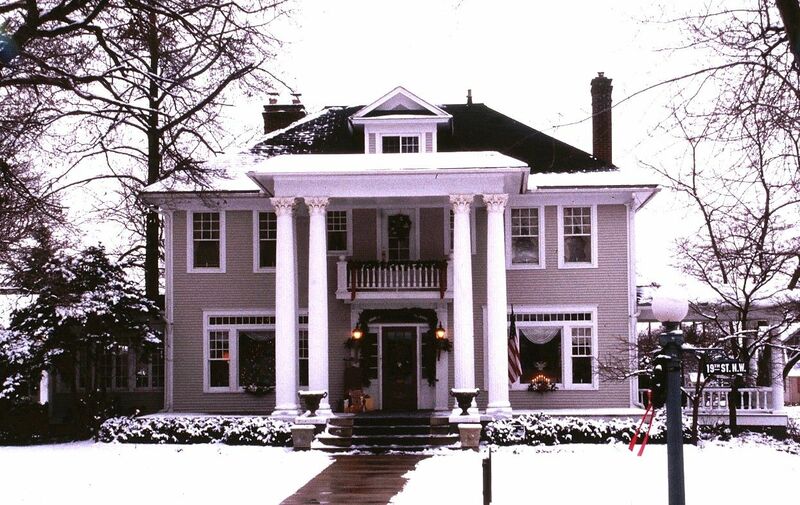 Only one hundred miles from Chicago, in Watseka, IL is an impressive Colonial Revival built in 1903 with many features in common with the Magnolia (Houses from Books, p. 194). I’d say there are a few other houses that have “many features in common with the Magnolia” - as in thousands. The Magnolia would be best described as a Colonial Revival, which was a hugely popular housing style in the late 1800s and early 1900s. Sears was not an innovator in anything, most of all, architectural design. They looked at what was popular and created their housing designs accordingly. Judging from the photos in Houses from Books, much of Reiff’s research was centered in the Northeast, specifically the New York area. 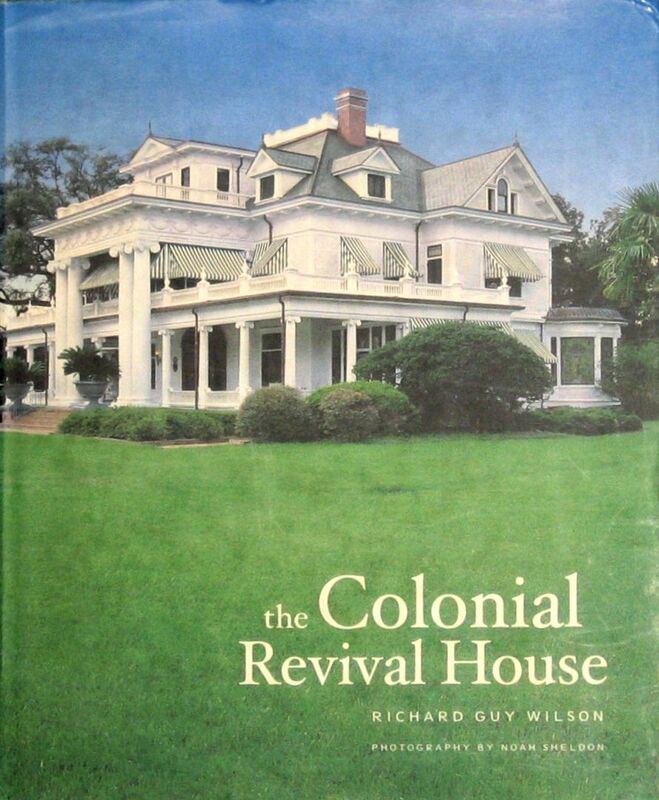 Mr. Reiff should have traveled down to the South, because we’re loaded with examples of what is commonly known as the Colonial Revival. 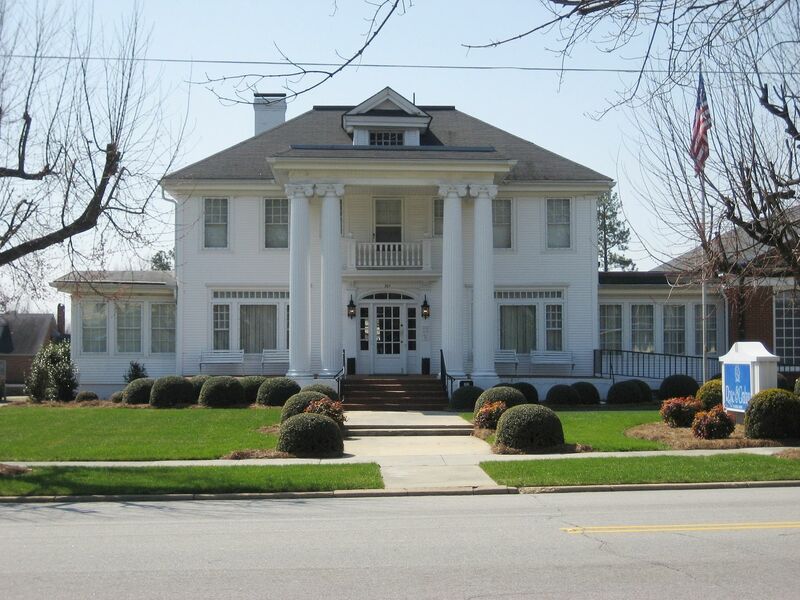 If I felt compelled to connect a specific house to the architect’s creation of the Sears Magnolia, I’d put my money on a 1910-built house in Blacksburg, SC (photos below). The South Carolina “Magnolia” was built in 1910, and based on the home’s interior moldings, mantels, staircase and some other clues, I’d say that the 1910 build-date is pretty accurate. And although this is a wild guess, I suspect that it MAY BE a pattern book house. This “SCFM” (”South Carolina Faux Maggy”) is four feet wider and four feet longer than the Sears Magnolia. When Sears “borrowed” patterns from other sources, they’d change the dimensions a bit, and in the case of the SCFM, it was a bit too big for Sears purposes, so shrinking the footprint made sense. One more interesting detail: The underside of the front porch (eaves) shows that there are ten brackets across the front of the Magnolia. The SCFM has eight brackets. The Magnolia’s dormer has four of these eave brackets. The SCFM has three. These are the kind of details that matter. Mr. Reiff also identified a Sears Magnolia in Dunkirk, NY. A second example of a brick Magnolia can be found in Dunkirk NY, Despite the lack of side wings because of the narrow lot, the similarities to the Sears model are still striking, but the house is much narrower than its model. In fact, although the 93 West Fourth Street is the same depth as the Magnolia (36′1 vs. 36), it is a full ten feet narrower (29.10 vs. 40.0). 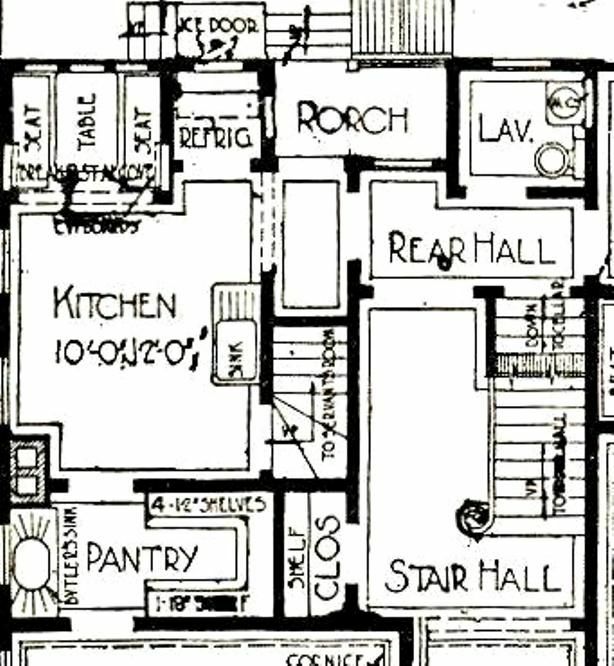 The plan of the Dunkirk house is considerably different. 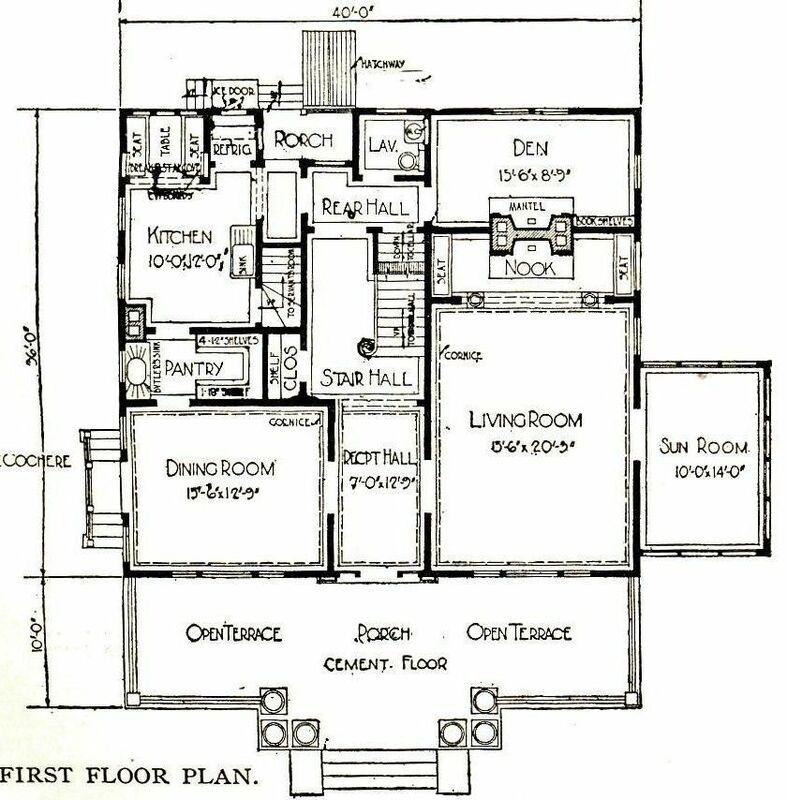 Instead of the formal central hallway with staircase and rooms on either side, here the plan is far more compact; One enters the living room which runs across the front of the house in the middle of its long side; the stairs are at one end…Here we almost certainly have an instance of a local builder who studied the illustration in the Sears catalog and created his own version of it, without ordering the plans or, in all likelihood, any of the materials from Sears (p. 196). 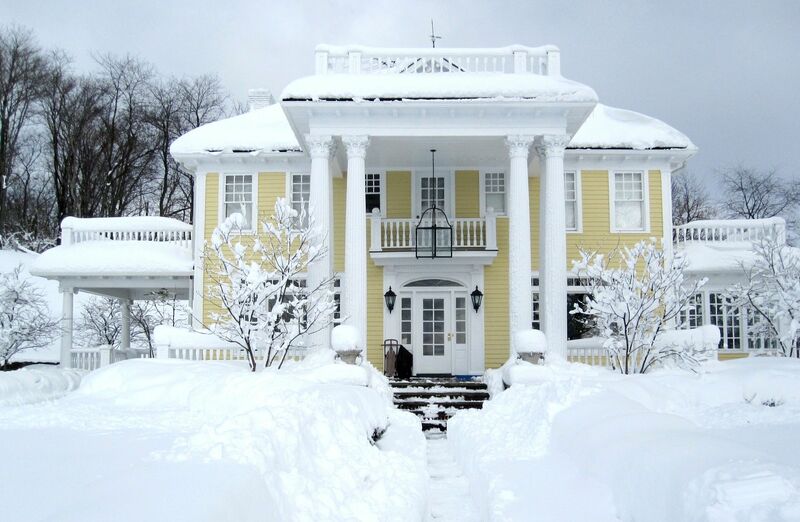 Besides, if you were going to name a house “The Magnolia,” would your inspiration come from the frozen North? Now, where is that 9th Magnolia? To see pictures of all eight Sears Magnolias, click here. 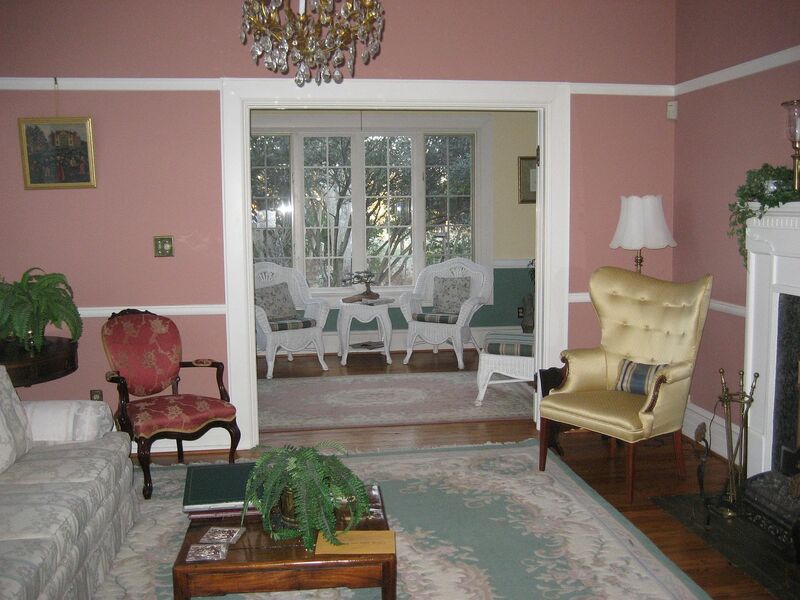 To read more about the “fake” Magnolia in SC, click here. If I were going to pick a house to have been a "model" for the Magnolia, I'd pick this house in Blacksburg, South Carolina After all, this actually looks like a Magnolia! 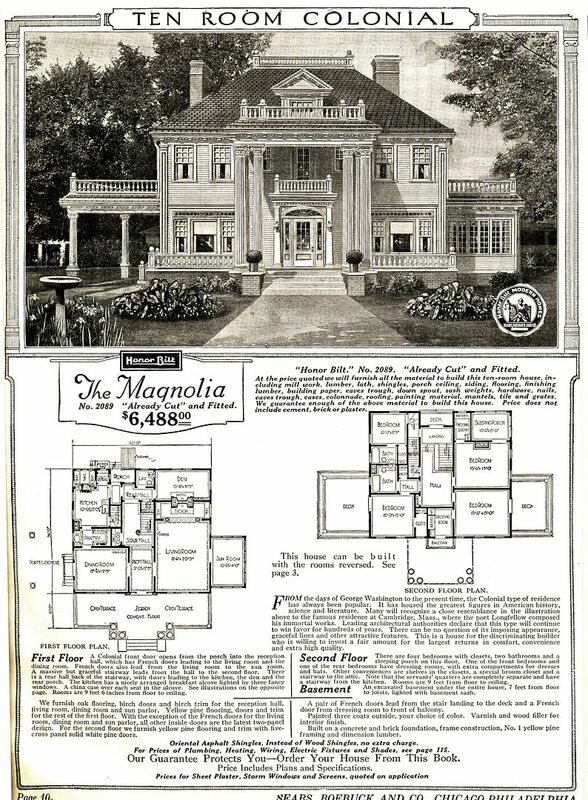 The Magnolia was offered from 1918-1922 and is shown here on the cover of the 1918 Modern Homes catalog. 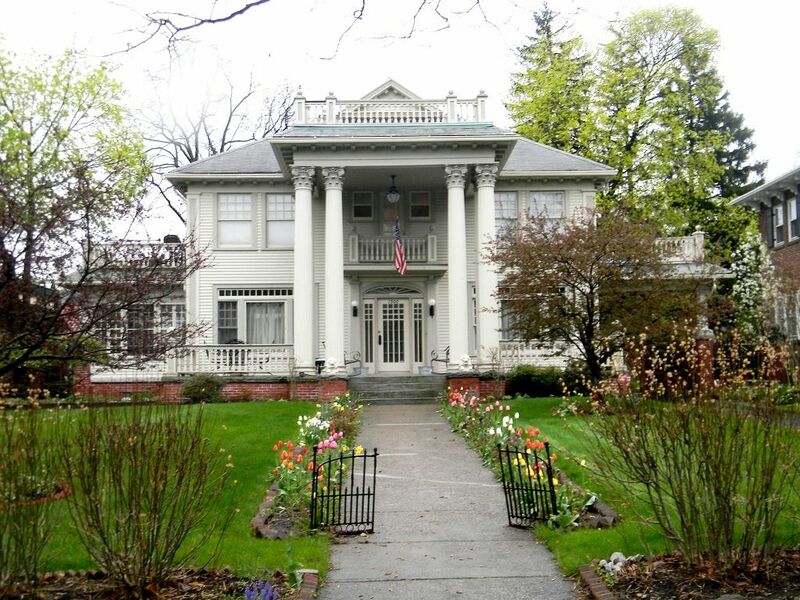 Some may describe it as a Colonial Revival, but really, it's a foursquare with delusions of grandeur. 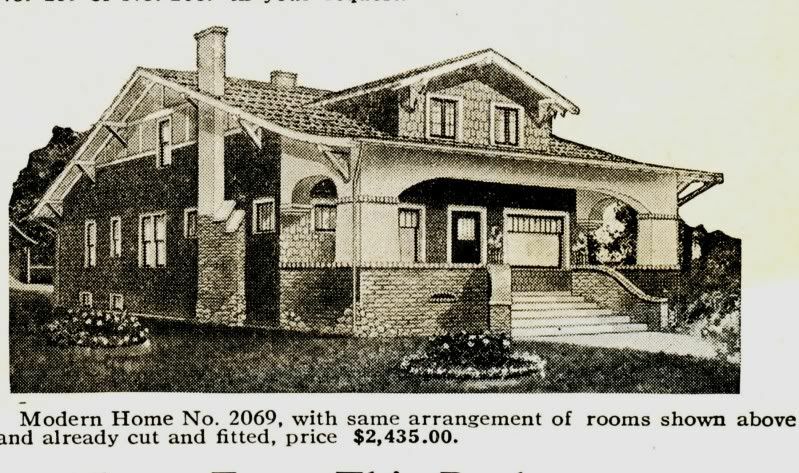 The Magnolia (1920 Modern Homes catalog). This house in Blacksburg, SC was built in 1910. You want to talk about a "model" for the Magnolia? This would be it. The house was wider and deeper than the Magnolia, but it would have been easy work to "cut it down to size" for inclusion in a kit house catalog. There are 15 small lites over the large windows on the first floor - just like the Magnolia. And, it's in South Carolina, just where you'd expect to find a "Magnolia"! The other big difference is the columns. The real Magnolia has hollow wooden columns (made of poplar). 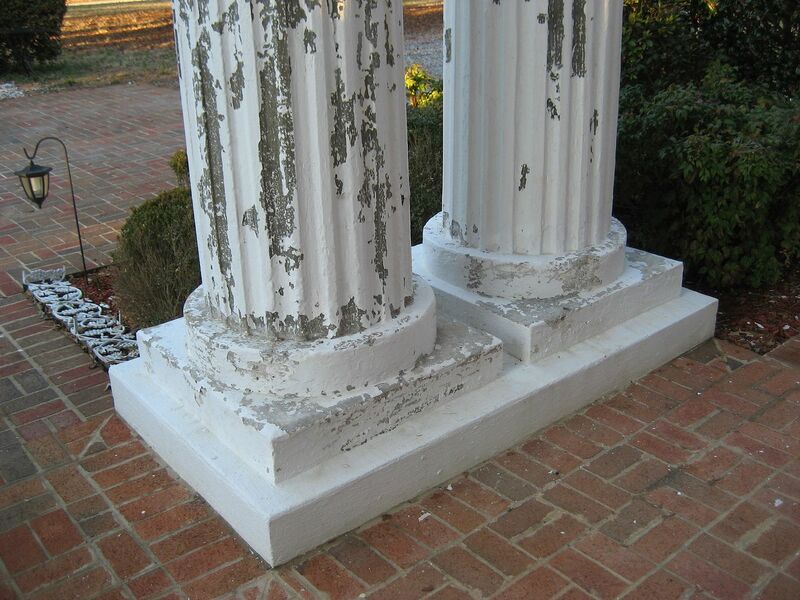 The house in Blacksburg had columns made of concrete. Try shipping *that* from Chicago! But boy oh boy, it's a close one!! Has those 15 lites over the window, too! 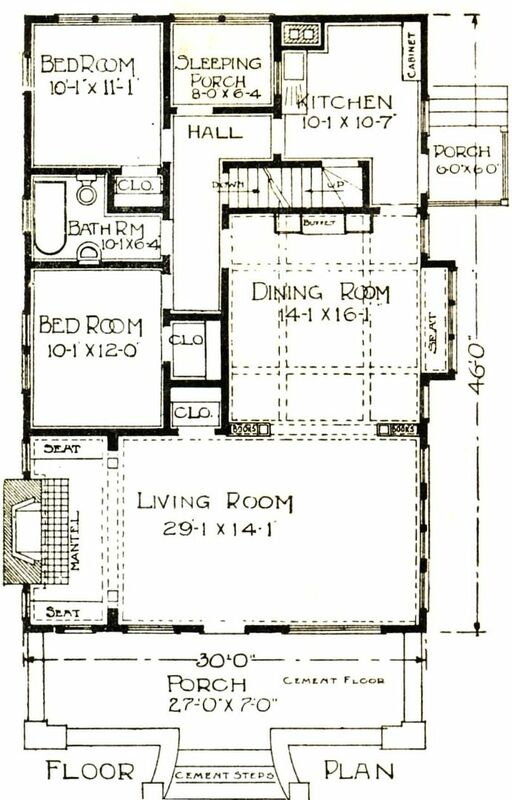 However, the interior floorplan was not quite right, and that's a big deal, too. Here's the real deal in Northern West Virginia. In June 2012, I traveled to Anderson, SC and found these two Colonial Revivals within a block of each other. 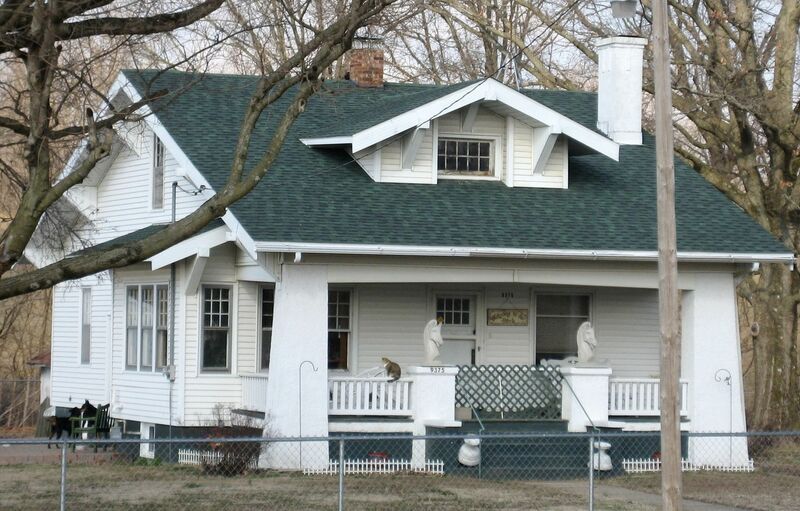 In the South, this house style is very popular and can be found in almost every old neighborhood. In fact, these houses might just be real Colonials (as opposed to a post-Civil war "Revival"). Better yet, if you’d like to buy a copy or Rose’s book, click here. To read about the now-deceased Magnolia in Lincoln, Nebraska, click here. The Sears Bandon is a rare bird indeed. The only one I’ve ever found was in Pulaski, Illinois, not far from the Sears Lumber Mill in Cairo, Illinois. That mill was the site of a 40-acre mill where Sears created and produced up to 250 pre-cut kit homes per month. It was a tremendous operation with more than 100 employees at its peak, and 20 acres of outbuildings. It was also the site of “The Experiment.” Click here to see the only remnant of the Sears Mill in Cairo. In 2001, whilst doing research on Sears Homes at the Cairo Public Library, I stumbled across a little item in their vertical file about a Sears Bandon built in nearby Pulaski. Later that day, I hopped into the car and drove out to Pulaski and found my Bandon on the main drag through town. It was perfect in every way. In March 2010, when I traveled to Illinois to do research for my newest book (”The Sears Homes of Illinois“), I went back to Pulaski to get newer/better photos. While standing on this main drag in this tiny town, I had three people stop and ask me if I needed help. Speaking as a former long-time resident of Illinois, I don’t miss those long, cold Illinois winters, but I surely do miss the kind, generous, hard-working folks of small-town Midwestern America. They’re truly the crème de la crème of our country. This document also stated that, in 1924, a Sears Cyclone Barn (shipped from Cairo, IL) was built on the property. 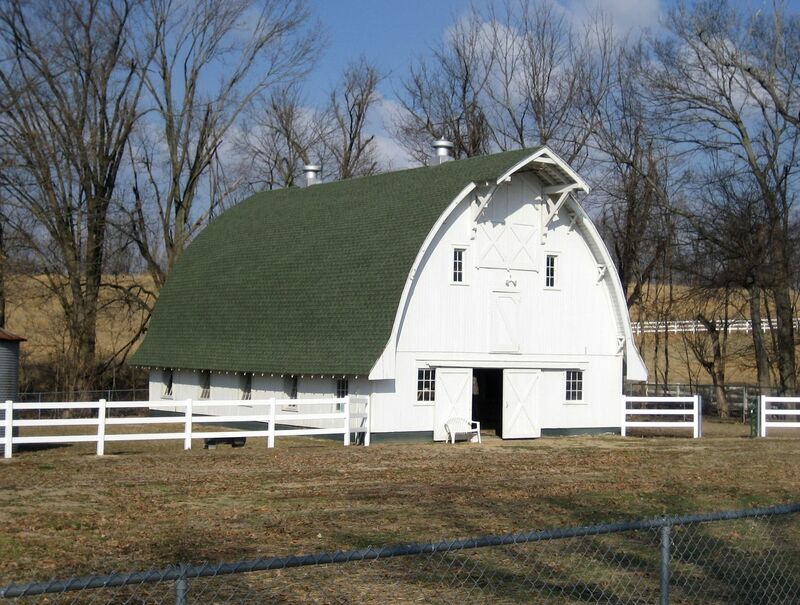 The kit barn cost $943.00. Is there a Sears Home in your neck of the woods? Please send photos to Magnolia2047@gmail.com. 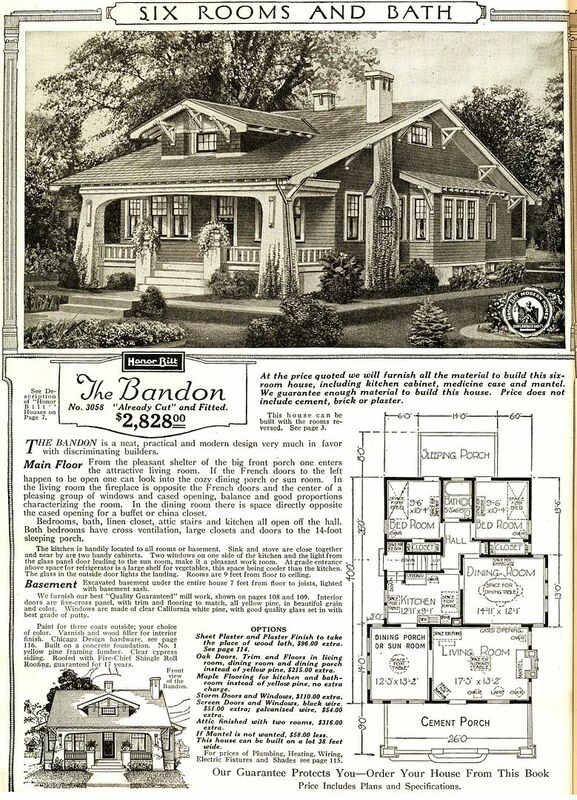 The Sears Bandon was a beauty, but why wasn't it more popular? 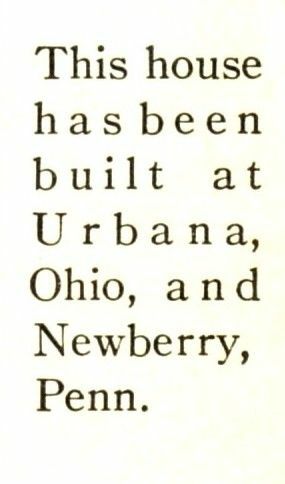 I've only seen one - ever - and that was just outside of Cairo, Illinois (image is from 1921 catalog). 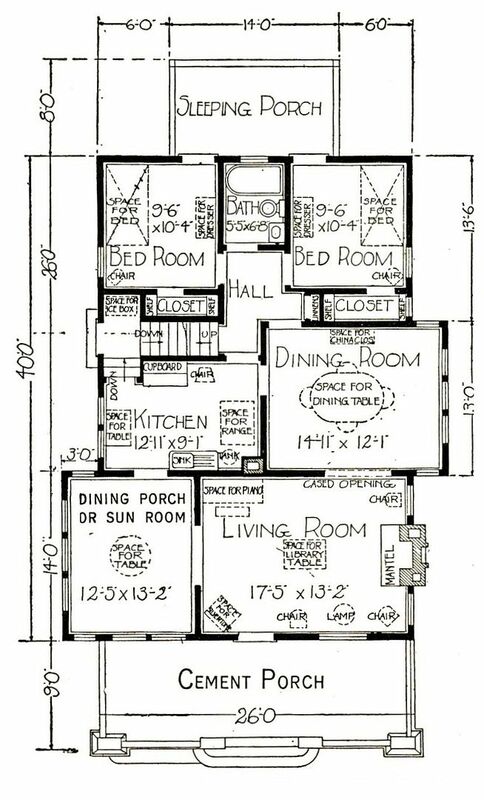 It had a very busy floor plan, and it's the only house I've ever seen with a "dining porch." This room - which jutted out from the rest of the house - had ventilation on three sides, and seven windows. 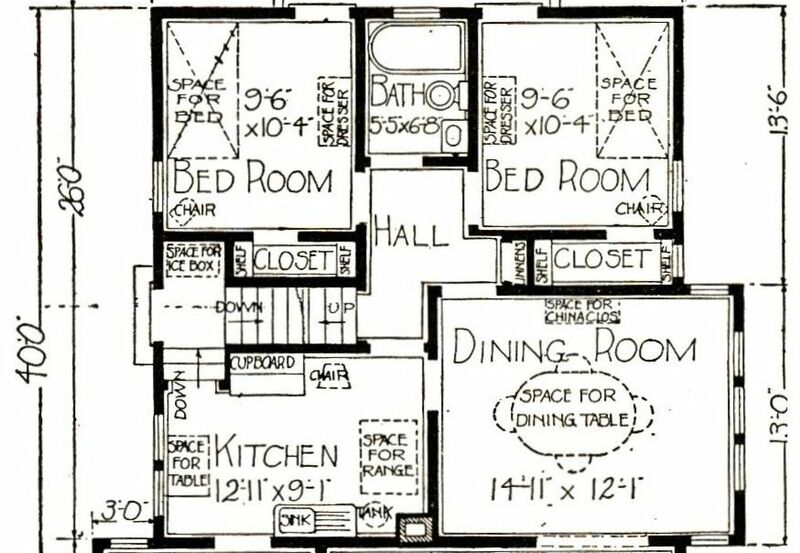 Close-up of the floorplan shows how busy this house is! Look at the kitchen! The ice box was in the staircase landing. And the kitchen was oh-so tiny! And it was a fine-looking house! And here is the real-life beauty in Pulaski! The 1921 catalog image included this thumbnail from straight--on. Pretty, pretty house! While southern Illinois does have some of the nicest people, it also some of the worst, mean, loud and scary-looking dogs! These dogs never did stop barking! The Sears Bandon is perfect in every way! It's perfect! Down to the details!! And it's in a beautiful, bucolic setting! 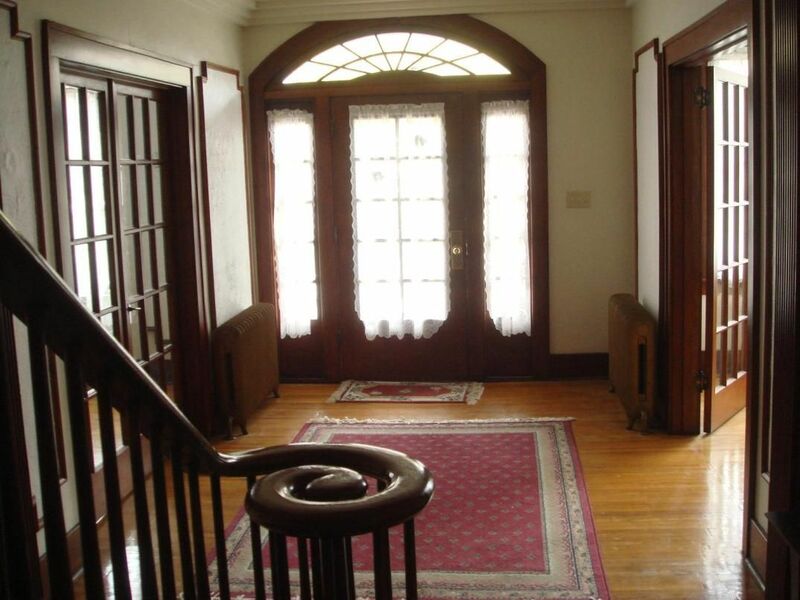 From this angle, you can get a better view of the Dining Porch. As a nice bonus, the old barn (built 1924) is still standing, and in beautiful condition. 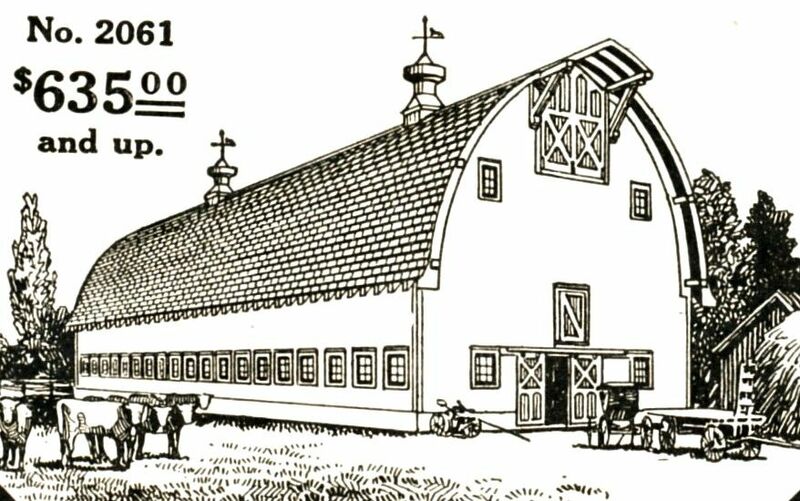 The Cyclone Barn was a very popular item for Sears (shown here in the 1920 catalog). Want to contact Rose? Please leave a comment below. To learn more about how to identify these homes, click here. Nary a week passes that someone doesn’t send me a note, happily reporting that they’ve spotted a Sears Magnolia in their neighborhood. And 99.99% of the time, they’re wrong. 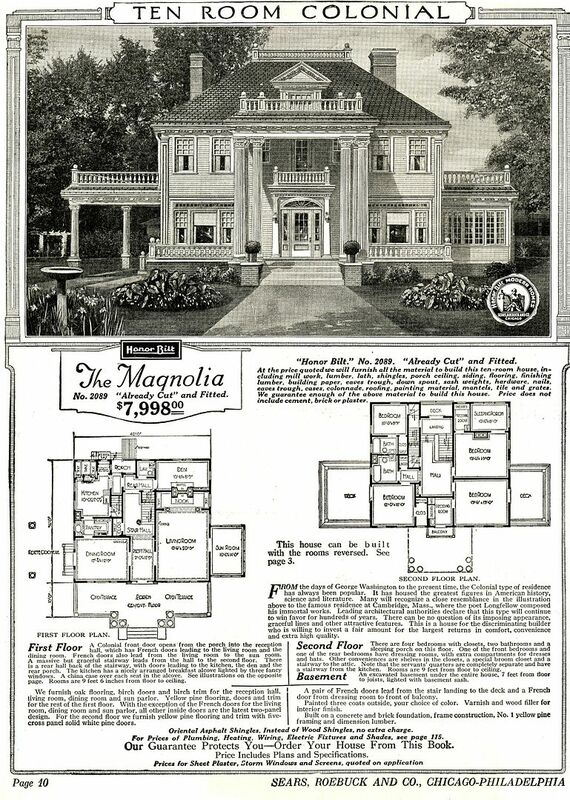 Priced at about $6,000, the Sears Magnolia (sold from 1918-1922) was Sears biggest and fanciest kit home. And despite lots of searching, only seven Sears Magnolias have been found. 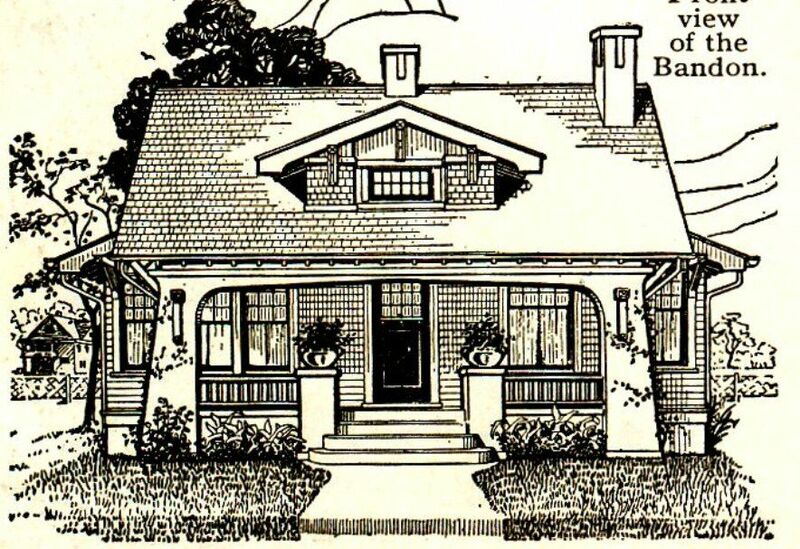 Like most of the 370 designs of houses offered by Sears, the Magnolia was purposefully patterned after a popular housing style: The Southern Colonial. 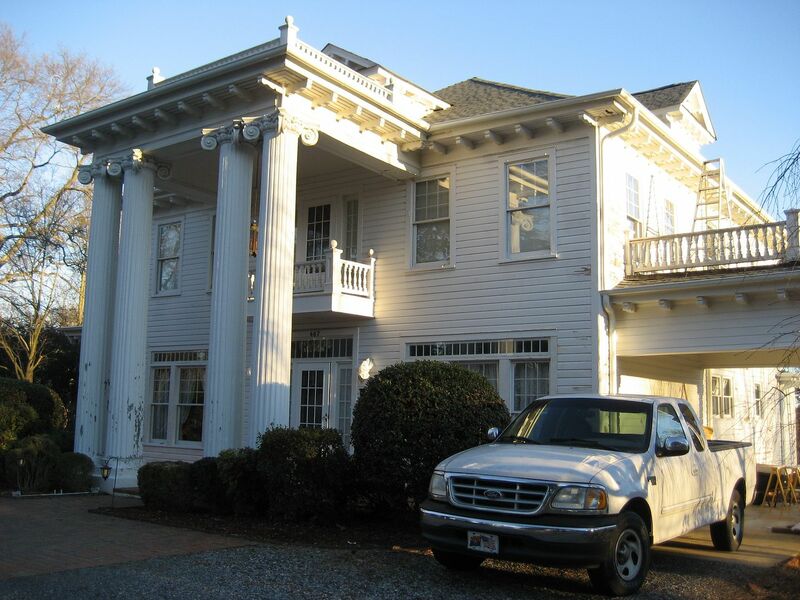 Here in Hampton Roads, there’s a Southern Colonial Revival in many of our early 20th Century neighborhoods. The photos shown below give some visual clues on how to identify the Sears Magnolia (the real deal). 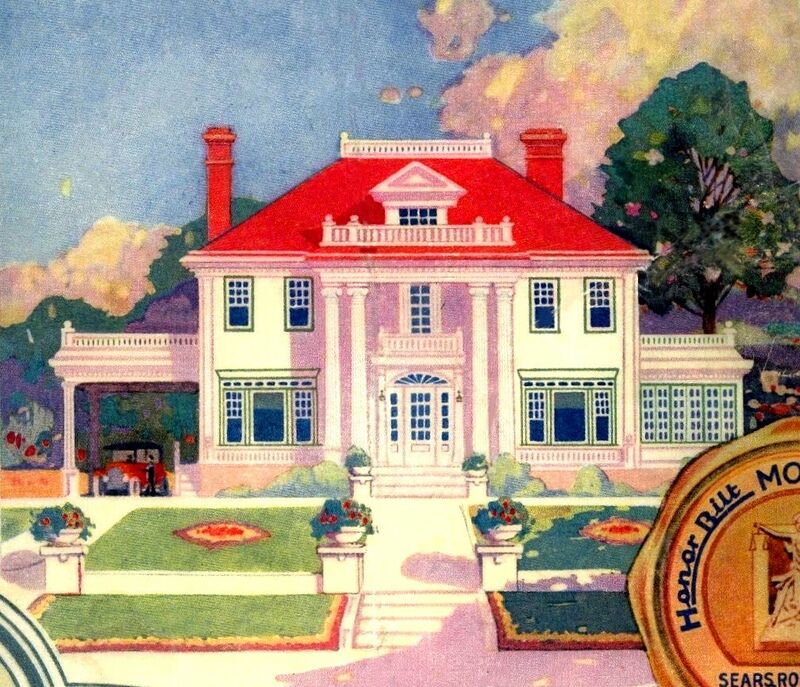 The Sears Magnolia was their biggest, fanciest and most expensive home. It was offered from 1918-1922. 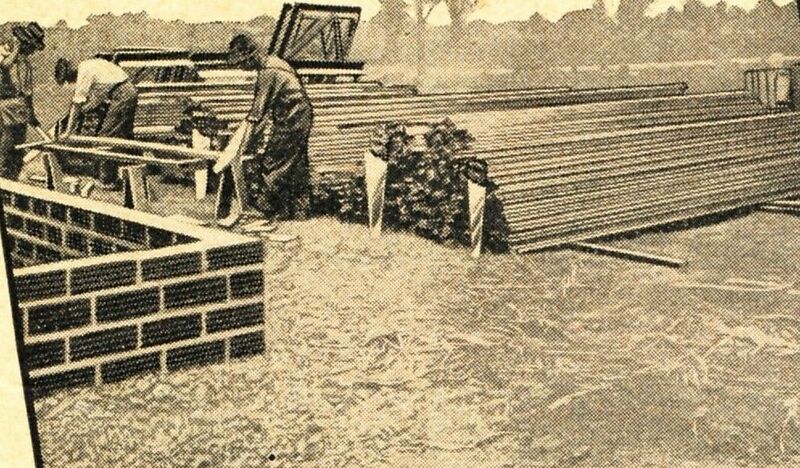 The picture here is from the 1921 catalog. If you look closely at the badge that shows the price, you'll see that the Magnolia was also known as #2089. 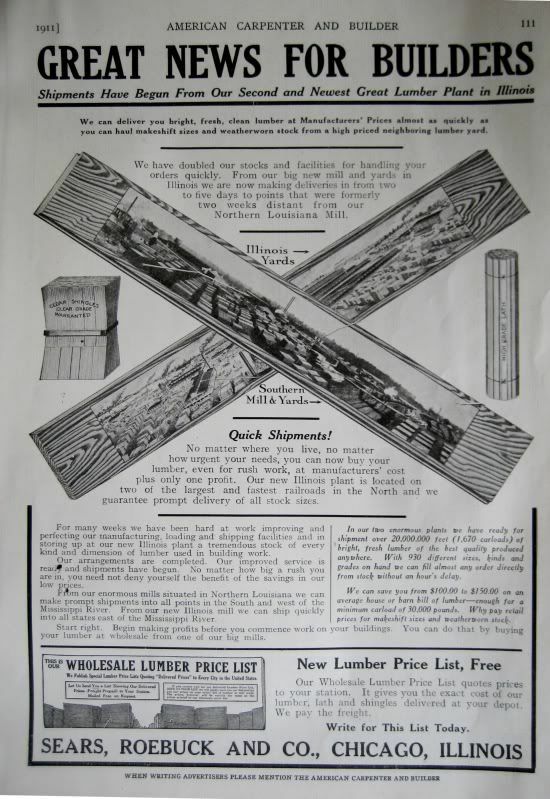 After World War One (The Great War), lumber prices went sky high. Sears catalogs had about a six-week lead time (from creation to publishing). 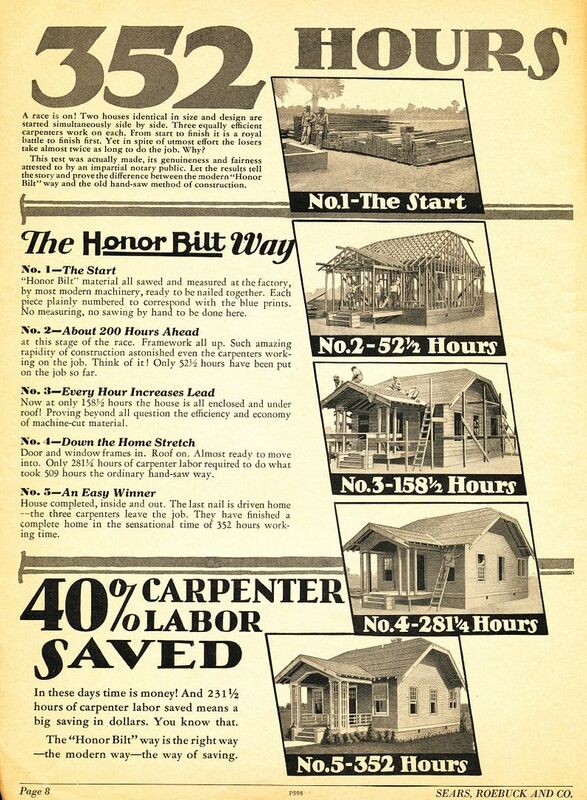 Due to the volatility of building material costs, Sears couldn't keep up on the price info. As an alternate, they just stuck price sheets into the pages of the Sears Modern Homes catalog. See the Magnolia above? 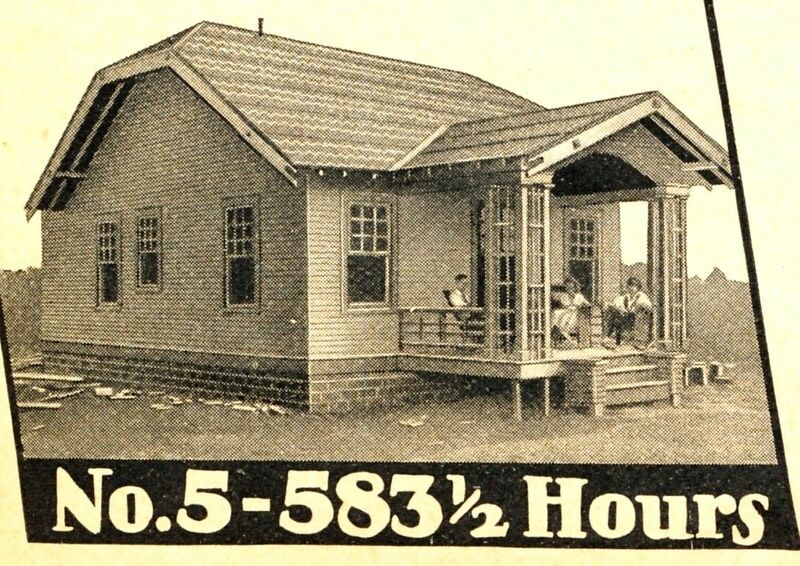 This shows the profound reduction in cost, in the Spring 1921 Sears catalog. The Magnolia had more than 2,900 square feet (as built). The first floor was pretty busy. Here's a close-up of the kitchen area and butler's pantry. Notice that there''s a downstairs "lavatory." Pretty upscale for 1921. A picture-perfect Magnolia in Benson, NC. And this one is in Canton, Ohio. 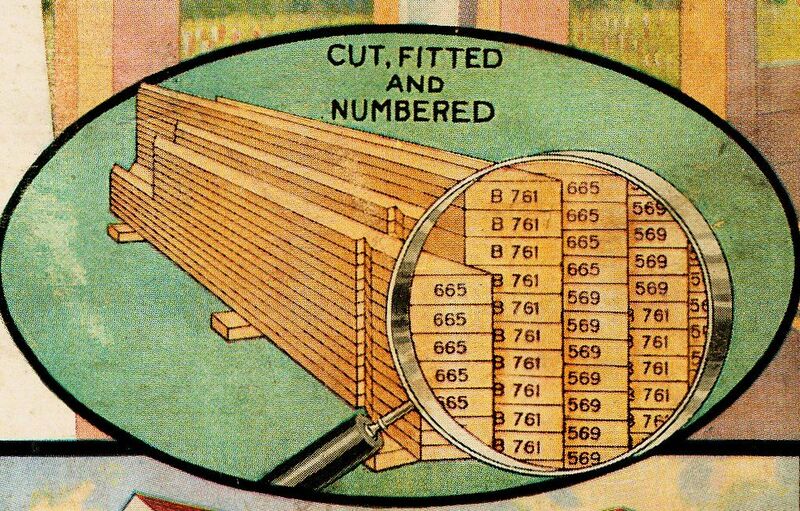 The lumber in Sears Homes was numbered, as is shown in this graphic from the rear cover of the 1921 catalog. The mark is on one end of the lumber, and also on the face of it (typically about 6-8" from the end). "B" was for 2x4s, "C" was 2x6s, "D" was 2x8s. 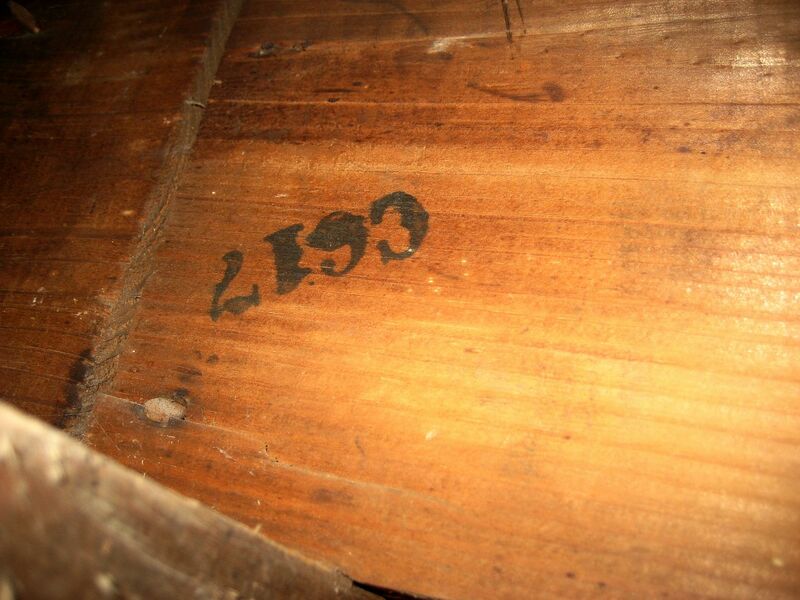 Here's a real life example of the mark on the lumber. The Magnolia was also known as Modern Home #2089. If you look closely, you'll see the number 2089 scribbled on this 2x8. This is the basement of the Benson Magnolia. 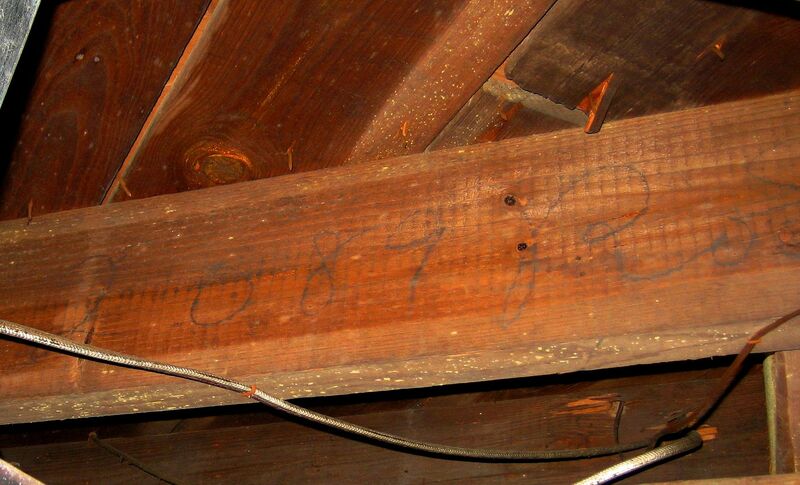 When the house was being prepared for shipment out of the mill in Cairo, Illinois, the model number was written on a few of the framing members. To the right is the name of the family that originally placed the order for this house. 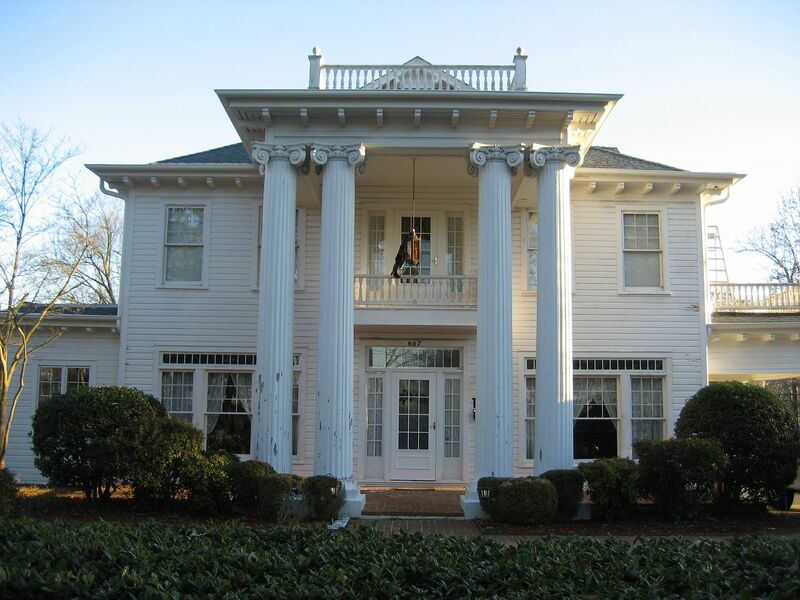 The Magnolia was offered with Ionic columns, but they're often replaced as they age. 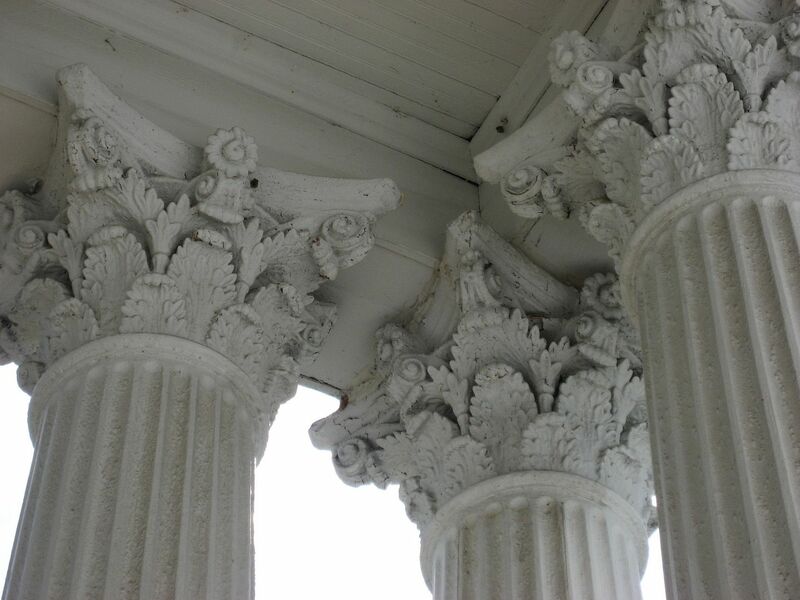 The Sears Magnolia's columns were wooden and hollow. Yet I've found that most "Southern Colonials" (with these two-story columns) have concrete columns. If you think you've found a Magnolia, go rap on the columns and if they're made of something other than hollow wood, then it is NOT a Magnolia. The entry hall of a Sears Magnolia in Irwin, PA. The details matter. Notice over the door, there's an arched fan light. 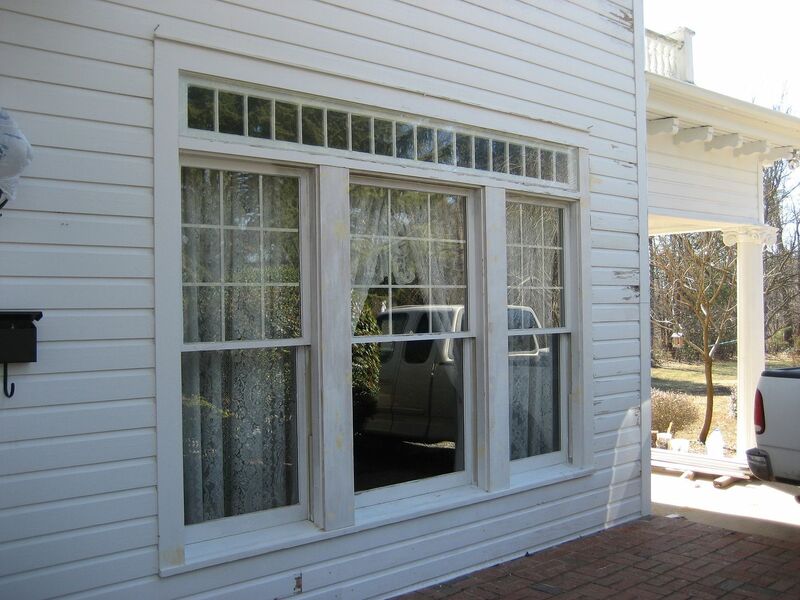 Many "look-alikes" have a square transom over the door. Learn how to pay attention to these many details. Notice these very distinctive windows on the Magnolia. 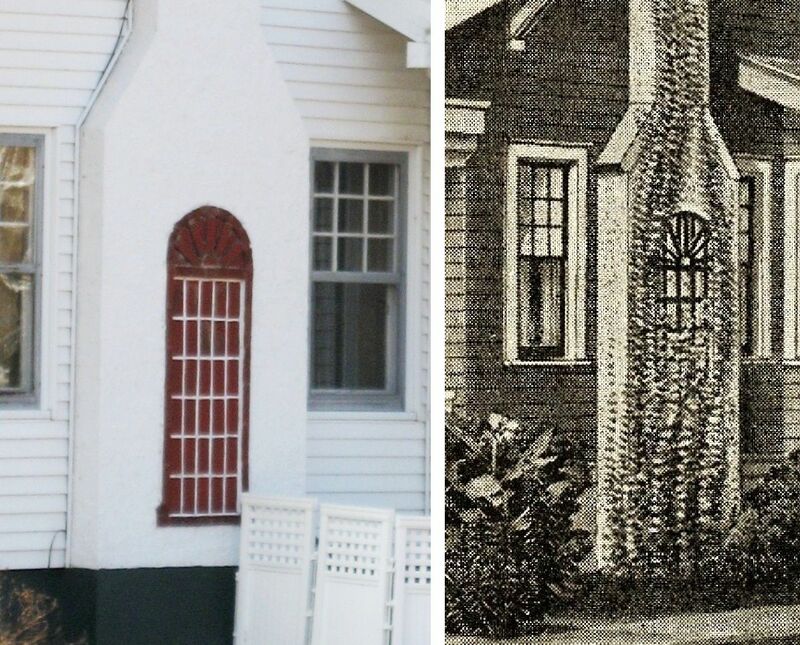 Does the house you're looking at have these very same windows? If not, it's probably not a Sears Magnolia. Here's another example of a Magnolia (located in West Virginia). 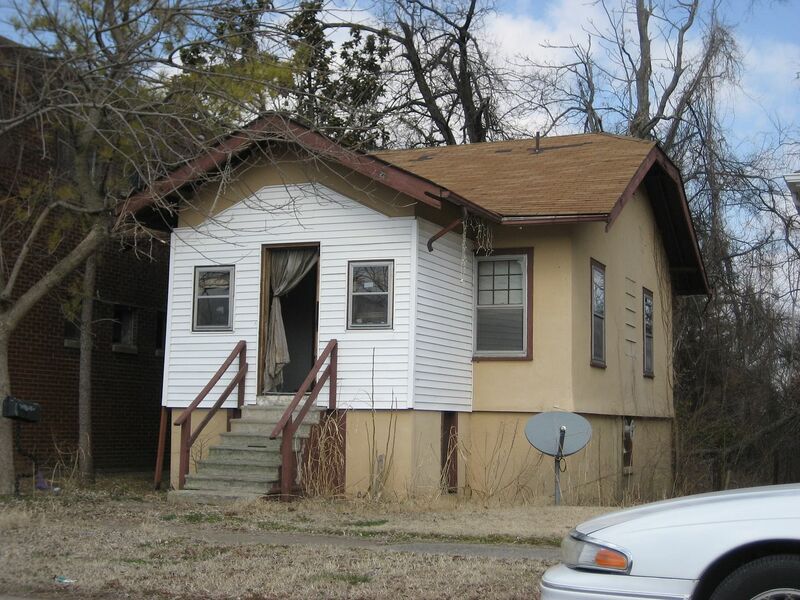 To read another really awesome story on Sears Homes, click here. My favorite blog (an interview with a man who built a Magnolia) is here. 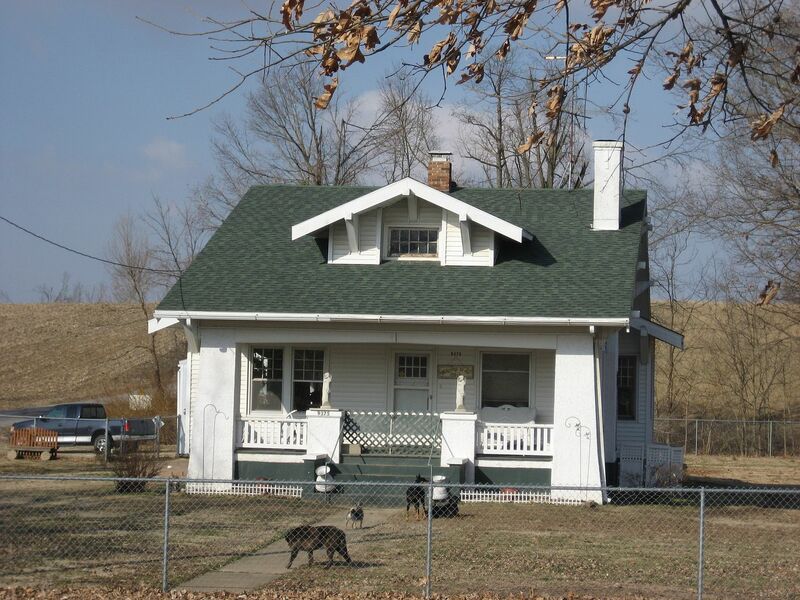 In February 2010, I traversed 2,500+ miles, driving throughout the Illinois hinterlands, seeking and finding Sears Homes. I’m firmly convinced that we all entertain angels unawares (although sometimes, I suspect that it’s the angels that find me pretty entertaining). Before I start out on these jaunts, I always say a little prayer, asking for a bit of divine guidance. Perhaps that’s how I came to land in Owaneco (a really tiny town). Turning onto the main drag (the only drag), I discovered this wonderful old Sears Hollywood. 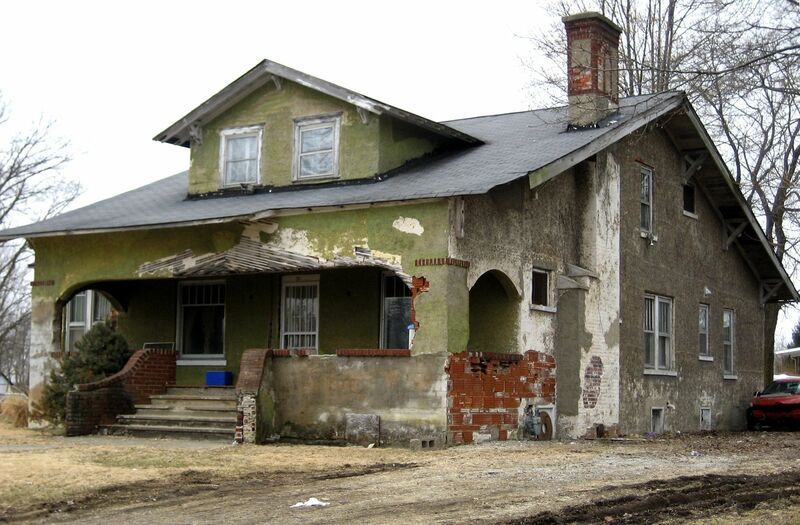 Yes, the house is a little tired but - the good news is - it’s in wonderfully original condition. It’s been more than two years since I first posted these photos. Since then, the owners contacted me and said that they’re working hard to do a faithful restoration. That’s always music to my ears! It was a gloomy day when I photographed this Sears Hollywood in Owaneco, but this is still one of my favorite photos from that trip. This house is still solid and square and true. The original catalog image from 1919. This was a very spacious house. The living room alone was 406 square feet of living area. The house itself was almost 1,400 square feet. And it even had a sleeping porch on the back! The Hollywood was offered in two different styles. 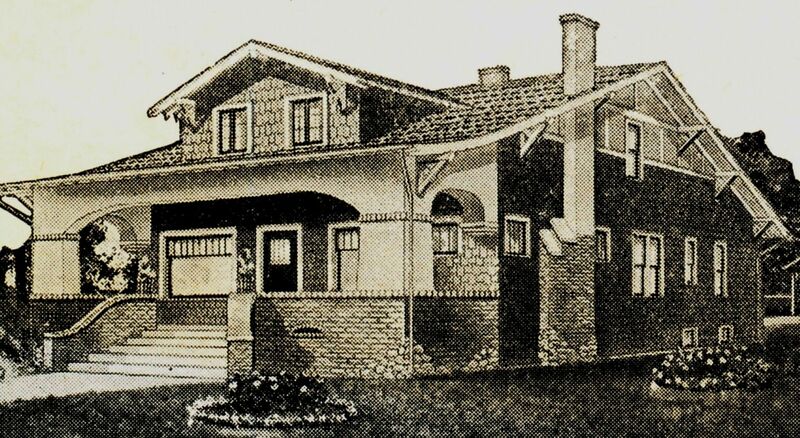 The house in Owaneco is the style shown in the lower right of the catalog page. I've reversed the image (as is shown directly underneath the home's actual photo). Sears plans could be "reversed" to take advantage of optimal lighting on the lot. According to the catalog, there are also Hollywoods in these cities! 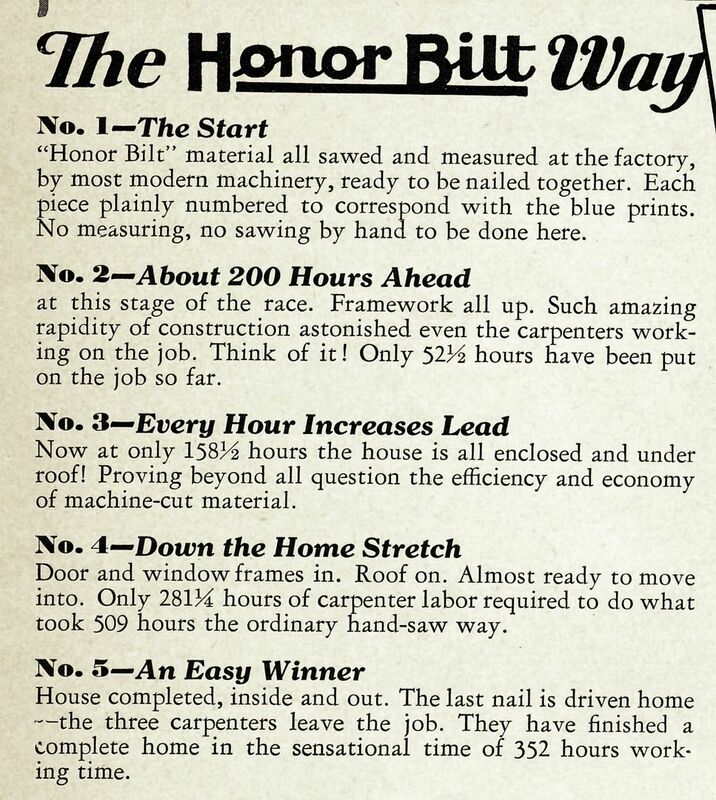 Sometime in late 1918, Sears conducted a “race,” building two houses, a Sears Honor Built pre-cut kit home and an identical house with no pre-cut lumber. 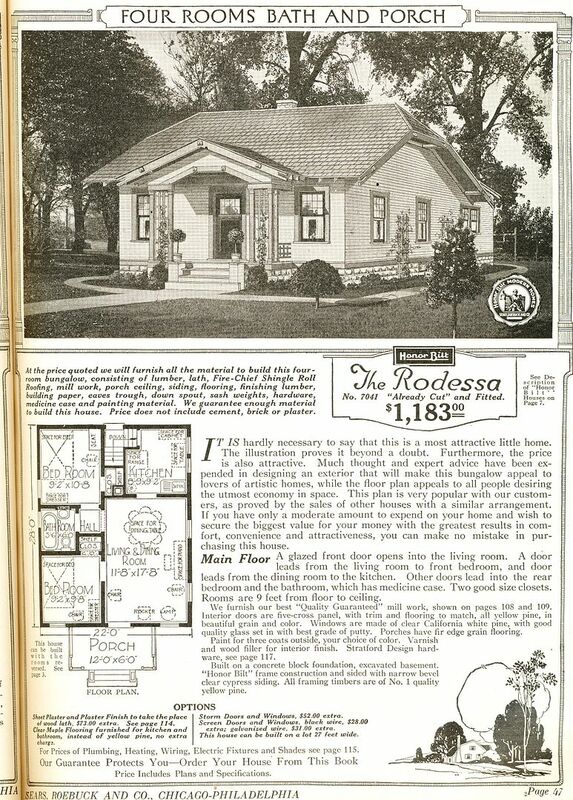 For their experiment, they chose the Sears Rodessa, a darling little bungalow with clipped gables and oversized eaves. The result of this race was thoroughly documented in the 1919 and subsequent Sears Modern Homes catalogs. It’s a very interesting story with many interesting images. The “race” was conducted at the Sears Mill in Cairo, Illinois (at the southern most part of Illinois). Today, those two Rodessas are still standing side by side, and they are the last remnant of the 40-acre mill that was once a substantial manufacturing center, employing more than 100 men, and cutting enough lumber every day to build 10-12 kit homes. The Sears Mill had 20 acres of outbuildings, several sidings of railroad track, and a massive berm, built to keep out the springtime flooding of the Ohio and Mississippi Rivers. The pre-cut Honor Bilt Rodessa was the easy winner in this race, with 231 hours to spare (compared to the stick-built house). To learn more about the specifics, read the captions on the photos below. To learn more about the old Sears Mill in Cairo, click here. Two Rodessas were built side-by-side at the site of the old mill in Cairo. 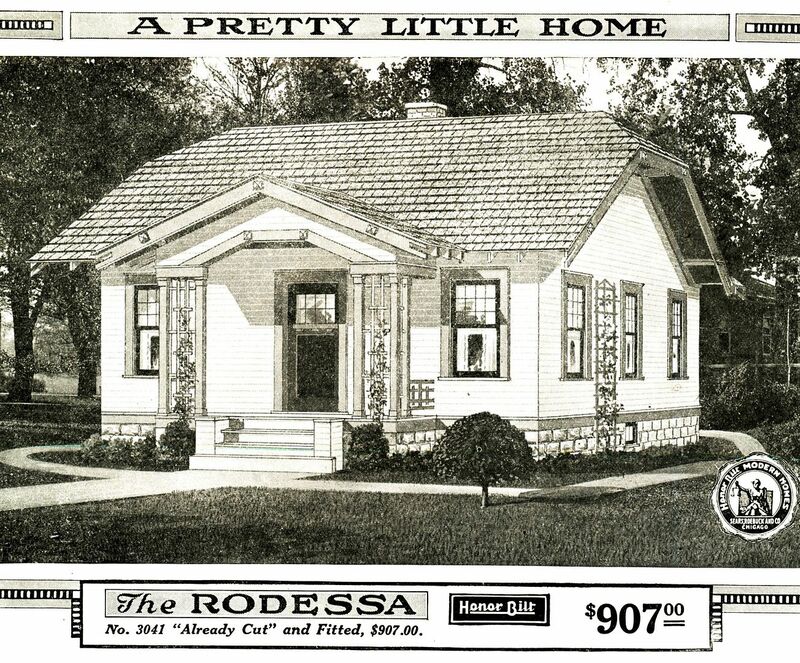 The house they chose to build was the Sears Rodessa (1921). Perhaps the Rodessa was chosen for this experiment because it was a "Pretty little home." After all, you probably wouldn't want to build a pretty BIG home for an experiment (1919). A thorough comparison of the two building techniques. 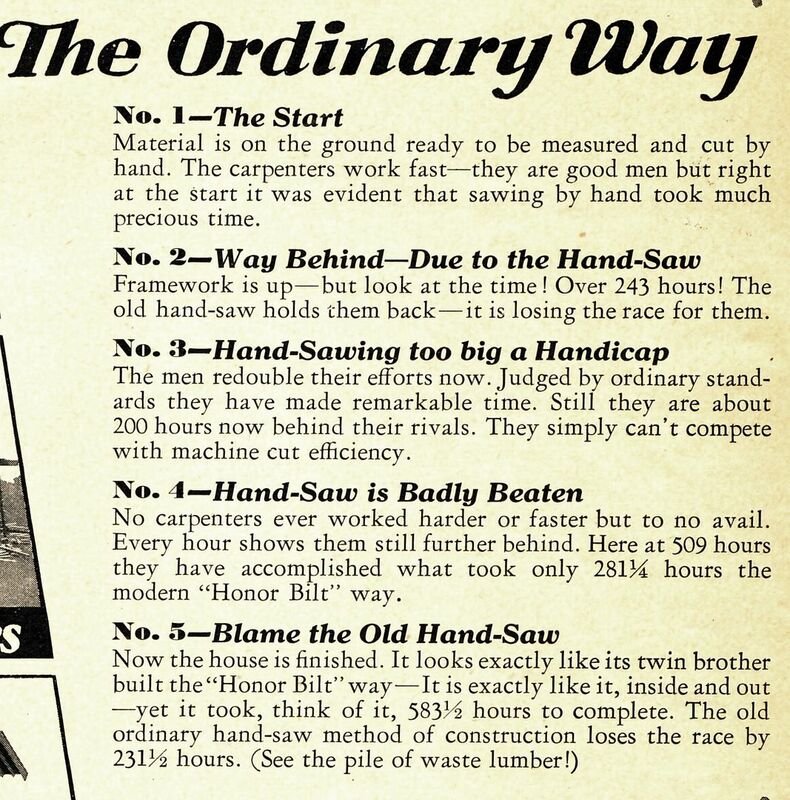 In the "ordinary" way, the old hand saw is to blame. In fact, many carpenters would not have used a steam-powered saw at the building site, but would be stuck sawing all the wood "the old fashioned way." The electric saw didn't come into widespread use until 1925 (according to "American Carpenter and Builder" magazine). The full page showing the experiment. 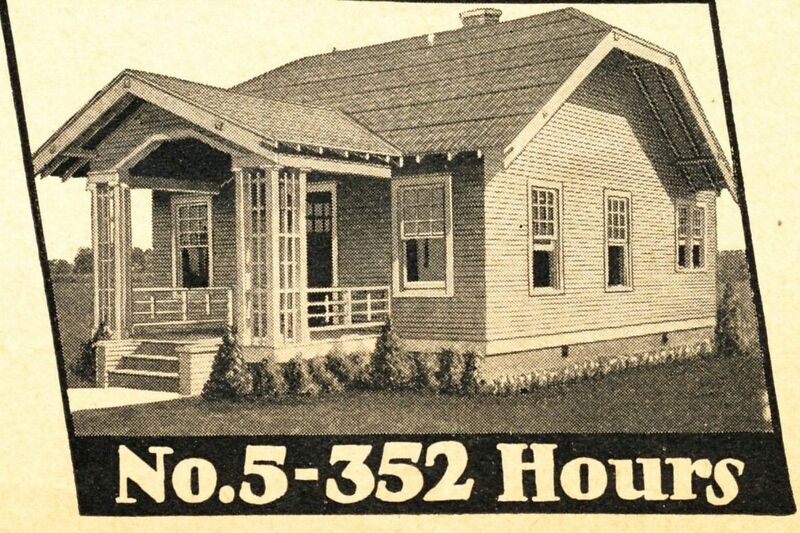 According to their experiment, a Sears pre-cut home could be built 231 hours faster than a stick-built version of the same house. And this was probably realistic, too. 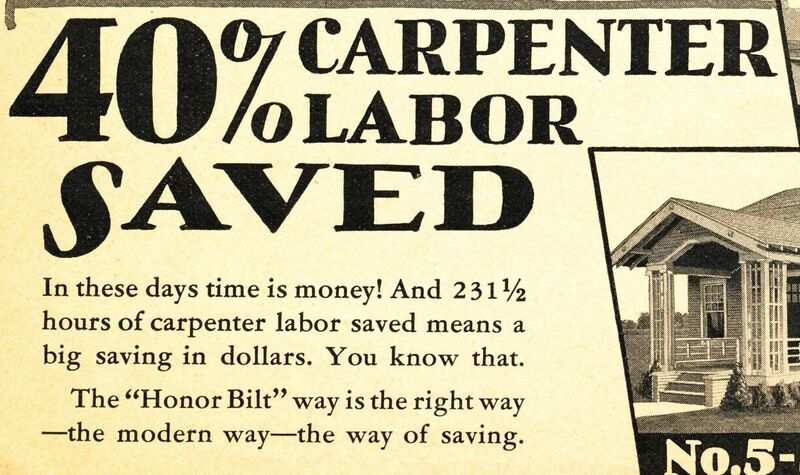 Pre-cut lumber did create a substantial savings of time and money. Time and money saved - "the modern way." I love this image. Look at these guys. They're a pair of slackers. All their lumber is pre-cut and ready to use. They can take their time and start the work day with a rest break. But look at these poor saps. They have everything laid out and ready. They even have their saws stacked up against the massive piles of lumber, ready to go. In fact, it looks like they've already started! And there are three guys on this crew. More than 230 hours AFTER the pre-cut Rodessa was finished, the stick-build Rodessa was finally done. Kinda of like being the very last soul to drag across the finish line at a 26K marathon. These folks are so pooped, they collapsed in exhaustion on the front porch. And the yard is still a mess, full of construction debris! They didn't have the time or energy to tidy things up. Why, they're sitting down before it's finished! The shame of it all!! Meanwhile, the pre-cut Rodessa was done 230 hours before the stick-built house, and the builders not only tidied up the yard but planted many fine-looking bushes! Pretty darn impressive. You think there's a little subtle message going on here? Looks like it to me! If you buy a pre-cut Sears House, you''ll have time and energy for pretty gardens! Throughout the city of Cairo, you'll find several Rodessas, such as this one. I suspect that the folks at the Sears Mill had several "practice" sessions building the Rodessa before the timed experiment actually took place at the mill. Today, those two Rodessas sit side by side, the last remnant of the massive Sears Mill that sat on this site in the early 1900s (in Cairo, IL). I'm sorry to say that I don't know which Rodessa is pre-cut and which one is stick built. If the graphic above is accurate the pre-cut kit house has a stucco foundation and the stick-built has a brick foundation. Next time I'm in Cairo, I'll check that out. BTW, these homes are located on Sears Road. 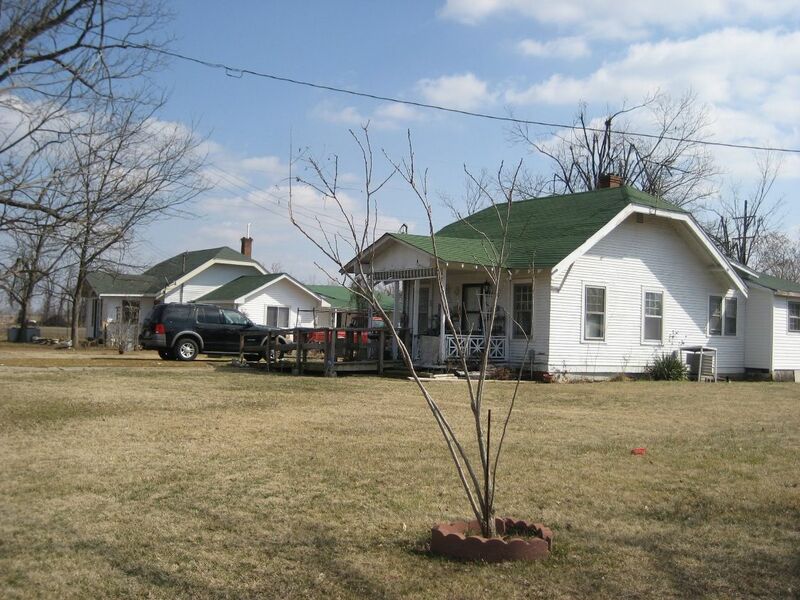 To read more about Sears and Roebuck Road, click here. To read more about the history of the Sears Mill, click here. During my long drive through the Illinois countryside, I found this Sears Hollywood (kit home) sitting just off the main drag in the tiny town of Owaneco, Illinois. 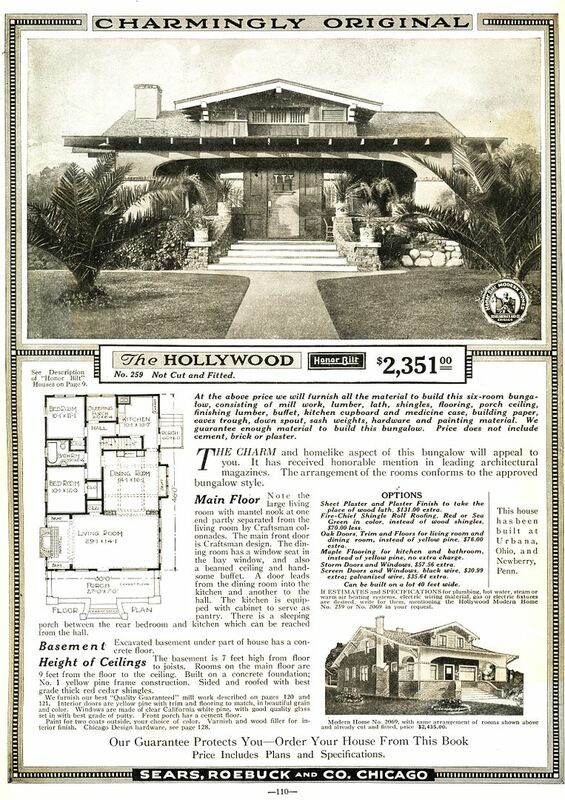 The house is a spot-on match to the original catalog image, but this poor Hollywood is in poor shape. Some of its flesh is missing and the skeletal system is also showing some signs of decay. 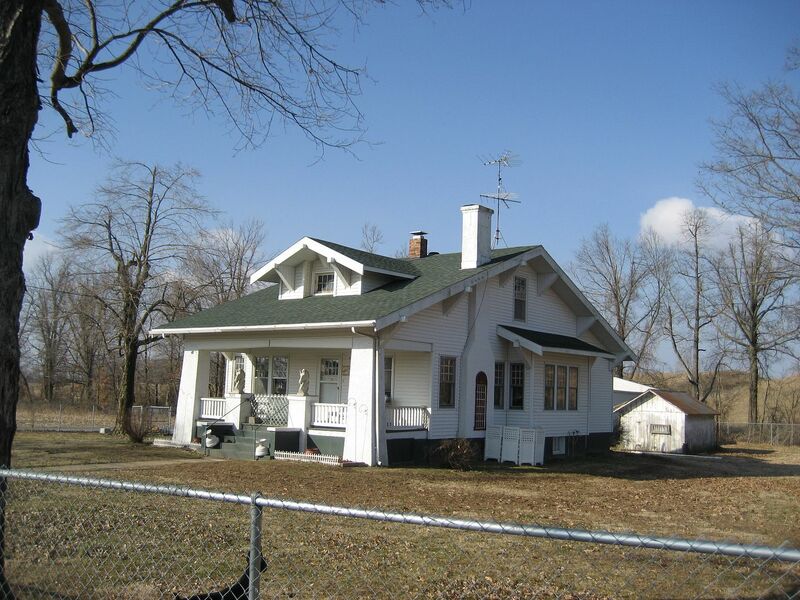 Perhaps someone from Owaneco will find this post and let the owner know that his old bungalow is actually a historically significant Sears Home! Updated! To read the most recent update on this house, click here!!! In May 1911, Sears opened up a mill in Cairo, Illinois. Cairo’s location at the confluence of the Ohio and Mississippi Rivers made it a natural for shipping and distribution. At the turn of the last century, Cairo (pronounced “Care-Roe”) could boast of having four major rail lines, enabling it to become a centralized shipping point for lumber harvested from the South and sent to the North. The Sears Roebuck Mill, also known as the Illinois Lumber Company, got its start when Sears Roebuck paid $12,500 for a 40-acre tract in North Cairo. On May 21, 1911, The Chicago Tribune reported that Sears intended to build a $250,000 plant. A few weeks later, The Cairo Evening Citizen had doubled that figure and reported “Half a million to be cost of new Sears Roebuck Plant” (July 29, 1911). In March 1912, F. E. Van Alstine, Superintendent of the Sears mill was quoted in The Cairo Evening Citizen as saying that Sears had chosen Cairo because of “their low freight rates, superior shipping facilities and other natural and commercial advantages, (which) made the city more desirable than St. Louis, East St. Louis, Paducah (Kentucky) or Memphis” (Tennessee). In mid-April, the paper said that all seven lumber sheds had been torn from their foundations and much of the lumber inside the sheds had simply floated away. By August, The Cairo Evening Citizen happily reported that despite the hard times and high waters, Sears Roebuck had decided to remain in Cairo. It also reported that about half the lumber sheds had been rebuilt and some of that floating lumber had been recovered. The same article reported that the folks at Sears corporate headquarters in Chicago were so pleased with Van Alstine’s post-flood restoration work that they presented him with a brand new automobile. 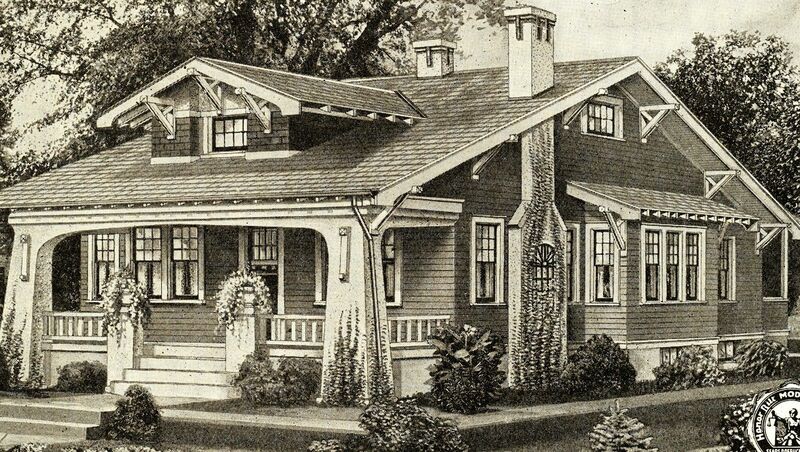 The mill produced everything for the Ready-Cut (precut) Sears homes except for millwork. 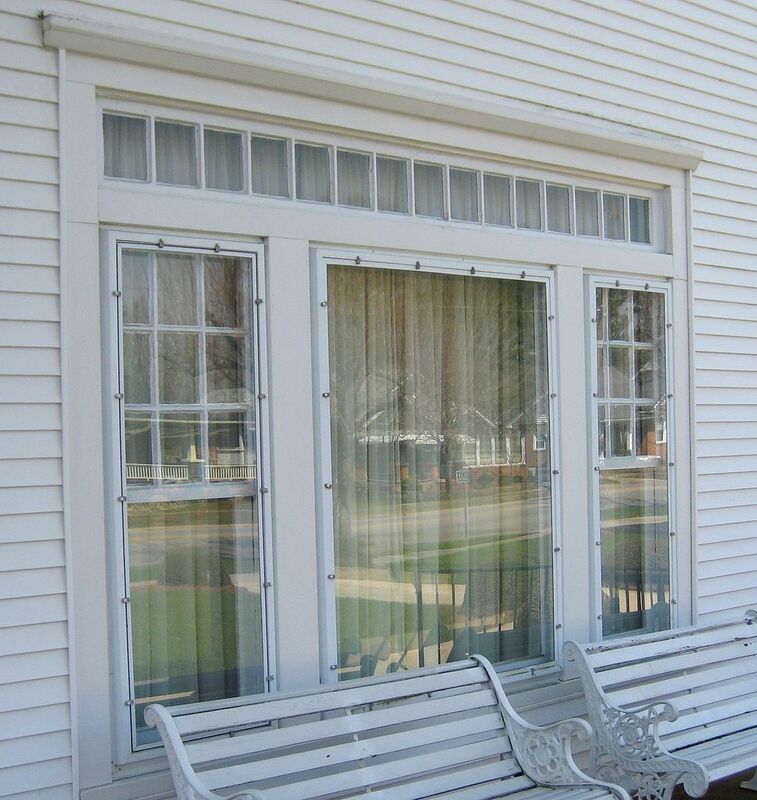 The Sears mill located in Norwood, Ohio, supplied millwork; windows, doors and interior trim and moldings. By the early 1930s, sales of Ready-Cut homes had plummeted and the mill began looking for other ways to generate income. They began building crating material for tractors and other large equipment, including Frigidaire refrigerators and appliances sold by Sears. In the late 30s, the mill produced prefabricated buildings for the camps which housed workers in the Civilian Conservation Corps. 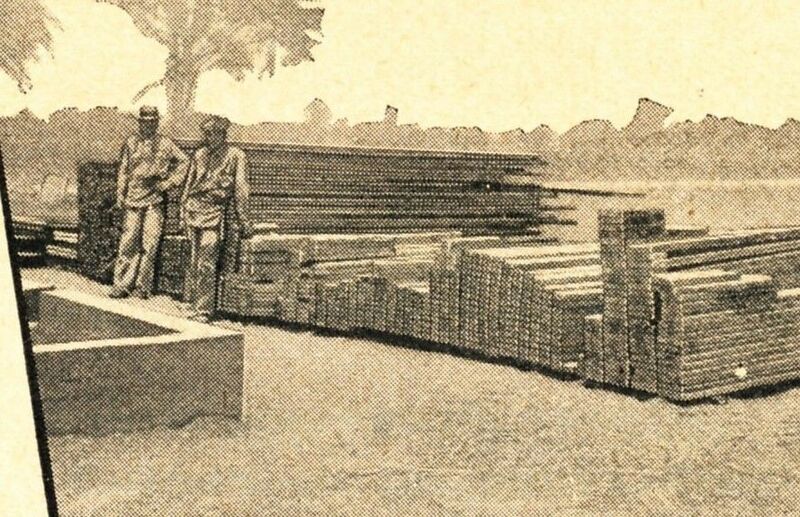 Wheeler relates that a typical CCC camp (which included several different buildings) required 400,000 feet of lumber and about 35 of these camps were milled and shipped by the Cairo plant. In 1940, Sears closed the plant and sold it to the employees. Shortly after the employees purchased the plant, they obtained a contract to build massive crates for shipping B-17 and B-29 bombers overseas for the war effort. All that remains today at the site of the Cairo mill are two Sears kit homes - two Rodessas - which were built as part of an experiment in 1921, to prove the superiority of Ready-Cut homes over traditional stick built homes. 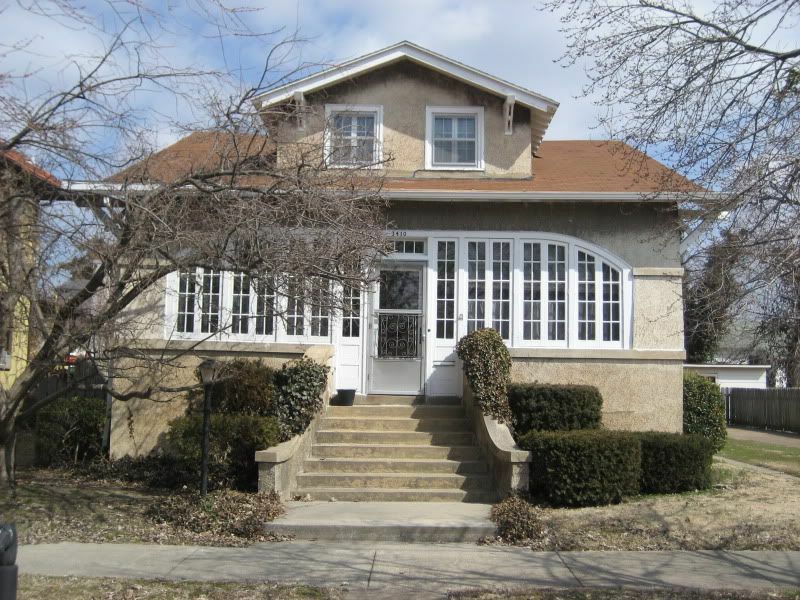 Not surprisingly, Cairo has a significant collection of Sears Homes, such as this “Hollywood” (see below). 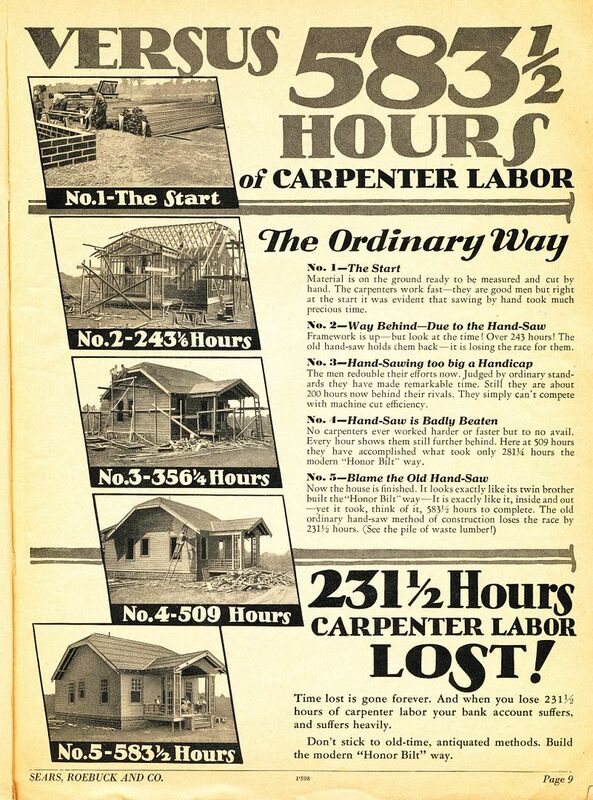 Below is an advertisement from the 1911 American Carpenter and Builder Magazine. To see pictures of Cairo today, click here.